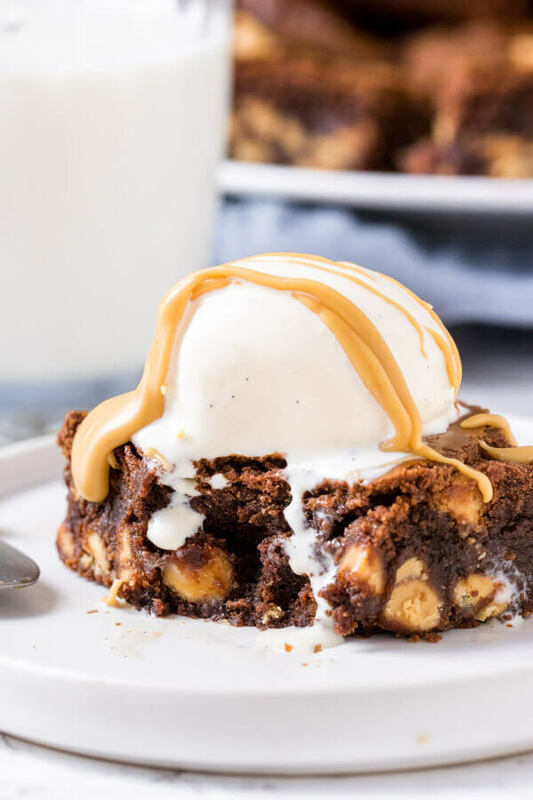 These fudgy, gooey peanut butter brownies have a delicious chocolate peanut butter flavor. We’re mixing peanut butter into the brownie batter and filling them with peanut butter chips for a double dose of peanut butter goodness. 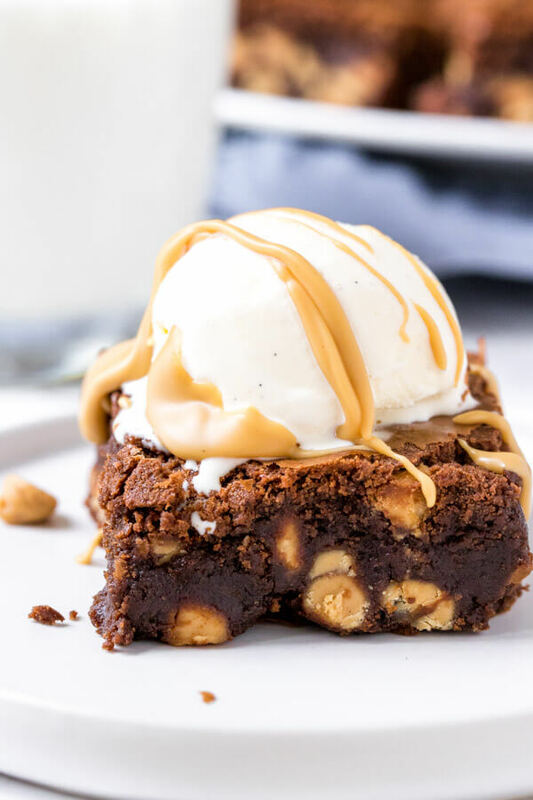 Today we’re combining 2 of my favorite things – peanut butter and brownies – to make the perfect treat. 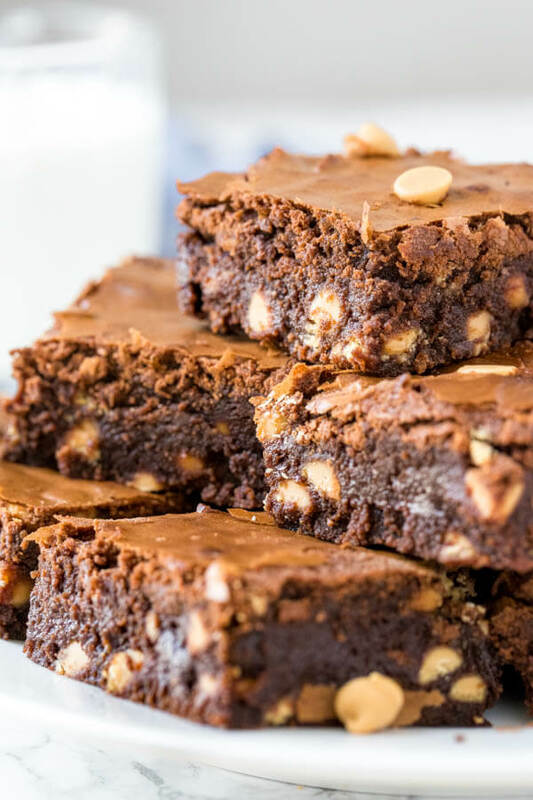 These peanut butter brownies are thick, fudgy, dense, and deliciously gooey. They have a chocolate peanut butter flavor that’s the perfect blend of salty, sweet, and chocolate-y without being too rich. And it’s an easy brownie recipe that’s made completely from scratch. 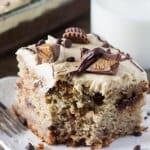 I’ve made peanut butter blondies before, and I’ve also made peanut butter frosted brownies – but I wanted a brownie recipe that actually had peanut butter in the batter to give them a chocolate peanut butter flavor. 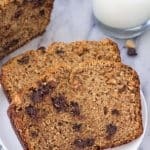 If you want to get straight to the recipe, feel free to scroll down. But for a full explanation of all the ingredients, why we’re using them, and how they make the brownies delicious – keep reading. 3/4 Butter. Creating brownies that are extra gooey is all about the fat content – aka butter. 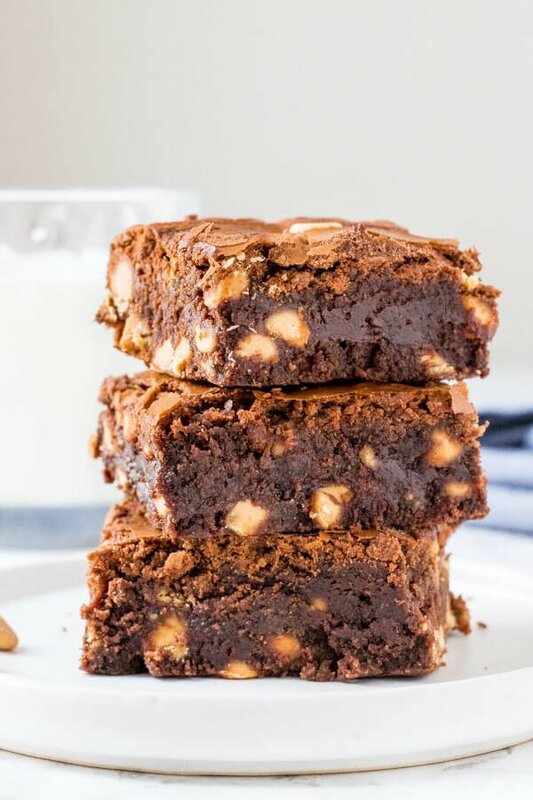 I find brownies that use butter have a superior flavor, and we need just the right amount of butter so that they arent’ dry. 8 oz Dark Chocolate. In this recipe, we’re melting together the butter, chocolate & peanut butter. Using melted chocolate as opposed to just cocoa powder in brownies produces a brownie that’s fudgier, gooier and less cakey. I used 50% dark chocolate in my brownies. Feel free to use semi-sweet chocolate for a little sweeter flavor, or 60-70% dark chocolate for a richer flavor. I do not recommend using unsweetened chocolate because the brownies will be too bitter and too rich. 1/2 Cup Smooth Peanut butter. I do not recommend using natural or whipped peanut butter in baking because it can separate and add too much oil to the mixture. 4 Large Eggs. Eggs bind the brownies together and give them a gooier texture. In this recipe, you’ll beat together the eggs and sugar before adding them into the batter. Beating the eggs and sugar together first helps to dissolve the sugar and therefore gives the brownies shiny, crinkly tops. 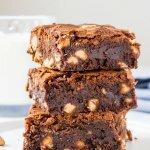 It also creates brownies that are thicker, and I also find it gives the brownies this delicious almost creamy taste that they don’t have otherwise. A pinch of salt to balance the sweetness. 3/4 cup all-purpose flour. When making brownies, carefully fold in the flour using a rubber spatula or wooden spoon. It’s important not to aggressively stir or beat in the flour, otherwise, the brownies can lose their chewy, gooey texture. 1 1/2 cups peanut butter chips or chocolate chips or Reese’s Pieces. The choice is yours. I prefer peanut butter chips because they add more peanut butter flavor. 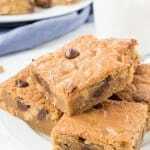 Then the secret to gooey, chewy peanut butter brownies is always in the bake time. This can vary from oven to oven. Cooking brownies in metal pan produces brownies with crispier edges and will tend to be a shorter baking time. Whereas baking brownies in a glass or ceramic pan will have a longer baking time (up to 5 more minutes). They’ll take 25-35 minutes to bake, and when they’re done the top should look set and an inserted toothpick will come out clean or with a few damp crumbs. Then make sure to cool your brownies fully before cutting into them. This avoids a big gooey mess and helps your brownies firm up and hold together. I actually really enjoy these peanut butter brownies cold from the fridge. And with a scoop of vanilla ice cream and a drizzle of warmed up peanut butter, you get a very decadent dessert. Lina 9x13x2 inch pan with parchment paper, or line with aluminum foil and lightly grease. Ensure there's an overhang over the sides - this makes it easier to lift the brownies out. Add the butter, chopped chocolate and peanut butter to a large microwave-safe bowl. Microwave for 1 minute on medium power (not high), remove from the microwave and stir. Repeat the process until almost melted, then stir until smooth. In a separate bowl beat together the eggs and sugar until glossy and lighter in color (about 2 minutes). Whisk the egg mixture into the melted peanut butter & chocolate mixture a little at a time. Carefully fold the cocoa powder, flour & salt into the batter using a rubber spatula or wooden spoon. Pour the batter into the prepared pan and bake for 25-35 minutes - or until the top looks set and an inserted toothpick comes out clean or with a few damp crumbs. The middle of the pan shouldn't wobble if you nudge the pan. Cool fully (about 3-4 hours) before cutting into squares with a thin, sharp knife. *Store brownies in an airtight container at room temperature for up to 4 days. Brownies freeze well, then thaw overnight in the fridge.